In Pakistan, Thousands Protest Against U.S. Drone Strikes : The Two-Way In a mainly symbolic move, the demonstrators blocked a major supply line for coalition forces into Afghanistan. The protest follows a drone strike outside Pakistan's tribal belt. Thousands of Pakistani activists from right-wing political parties protested against U.S. drone strikes on Saturday. 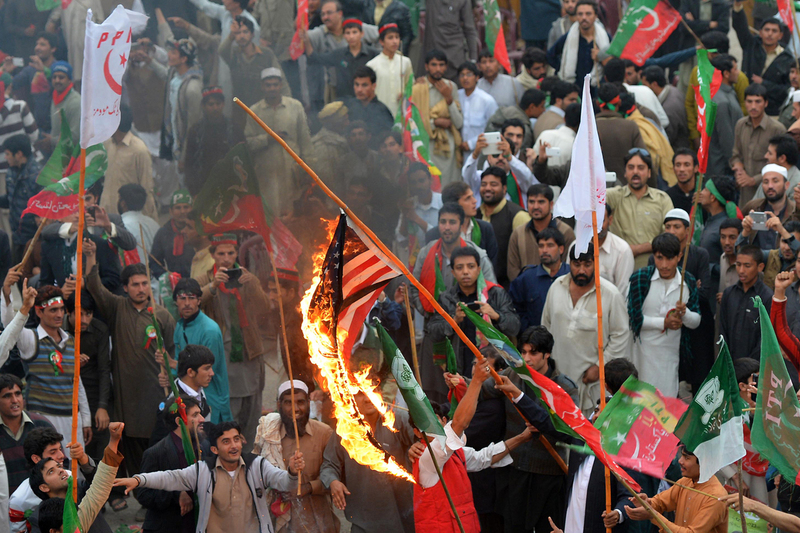 Thousands of demonstrators took to the streets of Pakistan to protest U.S. drone strikes inside their country. "Some 10,000 people turned out, brandishing flags and chanting slogans. "They're among those Pakistanis who say CIA missile strikes are a violation of their sovereignty, and too often kill civilians. Imran Khan, the politician and former cricket star, led the protest, which was in the city of Peshawar. "There'll be 'no peace' in Pakistan until drone strikes stop, Khan said. "The crowd blocked a NATO supply route in a largely symblic gesture; officials said few trucks run on Saturdays. Emotions are stoked by this week's rare U.S. drone attack outside Pakistan's tribal belt. "Five people were killed in that [Thursday] strike, including a senior figure from Afghanistan's Haqqani militant network." Drone attacks have, of course, been controversial for a long time. After a drone strike that killed 24 Pakistani soldiers in 2011, Pakistan closed that very same supply line for months. The AP reports that following a recent strike, Khan tried to convince the Pakistani government to close off the supply route again. When it became clear the government would not do so, Khan arranged for this protest. As Al Jazeera reports, the drone issue is politically tricky. Pakistan publicly denounces drone strikes, but the government is "known to have supported some of the strikes in the past." The network says the U.S. Embassy in Islamad declined to comment on the protest.